Display ads have generally been the purview of larger brand name companies who can afford the cost of creating highly visual or dynamic ads. However, Aaron Finn and his team at AdReady want to bring banner advertising to even the little guys. AdReady is an application for managing a display advertising campaign, from creating the ads all the way to managing and tracking their progress on three main ad networks: Google, RightMedia, Advertising.com. In exchange, AdReady takes a 20% cut of your ad budget. Aaron got the idea for the site while managing a $100 million a year in ad campaigns for Classmates.com. While normal display advertisements can take a week or two to make and cost a couple grand, AdReady lets you pick a basic set of ads (skyscrapers, banners, etc) from their library and customize it to your specifications. Ads vary by customization, but often let you place your own message, images, or logo on the units. 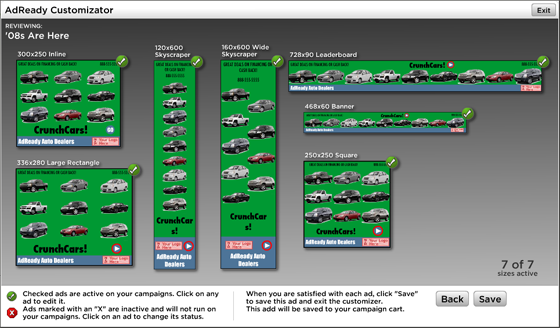 Some are even interactive, like car ads that let you change the color of the cars in the ads. It’s like a more practical version of the Flickr photo Ad Generator we covered back in January. But not all ads are created equal. AdReady incorporate all the best practices for ad design as well as sort the wheat from the chaff by tracking and ranking the click through rate on each ad in their inventory as customers use them. Though I imagine an extreme reliance on the data will produce a lot of generic advertising. Although a lot of the ads are rather generic to begin with by the virtue that they have to be a one size fits all solution. After you have your ad, you tell the system your advertising budget, which it splits between Google, RightMedia, and Advertising.com’s networks based on the ad’s category and geography (i.e. car ad for San Francisco). You can take the system’s suggestion, or choose your own budget allocation. As your campaign progresses you can track the ads in AdReady’s own dashboard and tweak the units for a more effective campaign. With Google’s purchase of DoubleClick and Yahoo’s SmartAds initiative, the focus is being drawn back on display advertising. A tool like AdReady helps even the little guys get in to the growing market. That is, unless Google does something like this too.